* Number 1 in the USA. * Will hold ½ pint of water. * Machine washable when dirty. * Storage tube with chamois to keep clean & moist. * Super soft fibres guaranteed not to scratch. 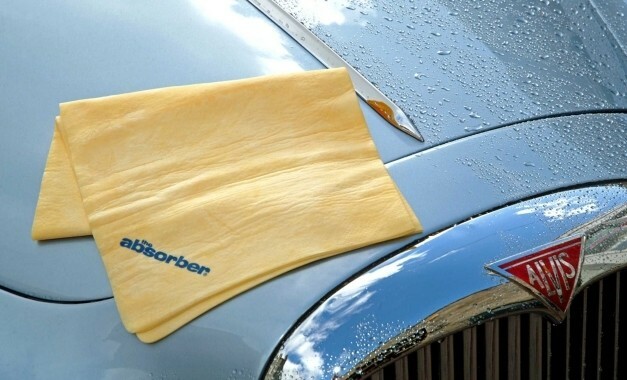 The Absorber is the revolutionary new drying skin from the USA. The micro fibre material will hold an amazing ½ pint of water. Developed in the marine industry it can be used on cars, bikes and many other uses including in the house. Supplied in a storage tube so the chamois can be stored damp so it is ready to use at a moments notice, simply put in the washing machine when dirty. Available in six colours, natural, blue, red, violet, yellow and turquoise.